In 2014, the DWR began efforts to place transmitters on American white pelicans. This was the culmination of ongoing cooperative efforts between numerous partners, including U.S. Army Dugway Proving Ground, the DNR’s Endangered Species Mitigation Fund, the Salt Lake International Airport and the Tracy Aviary Conservation Science Fund. Cutting-edge satellite transmitters were procured for the pelicans. Every ounce is vitally important when placing transmitters on birds. The solution is solar power, obviating the need for heavy batteries and allowing the transmitter to draw power from the time birds spend in the sun. To prevent interference with flying or grooming, the solar-powered transmitters sit on birds’ backs — in the case of pelicans, between their shoulders like a backpack. Properly fitting the transmitter to the pelican is also crucial, so Utah biologists were trained to attach the backpacks by experts from Mississippi Wildlife Services and The Nature Conservancy. Transmitters in hand, the next step was to catch the pelicans. The DWR has a history of banding younger birds. Adults, however, required a bit of a learning curve. After discovering the best method to catching the wily adult pelicans, DWR biologists set about distributing transmitters at Bear River Migratory Bird Refuge, Ogden Bay Waterfowl Management Area, Farmington Bay Waterfowl Management Area and Strawberry Reservoir. Catching birds and outfitting them with fancy new backpacks is only the first part of the story. The DWR wanted to see where the pelicans were going. In the past, this meant waiting for people to see the birds and report it. Using this method, Utah white pelican sightings have been reported from 10 states including some as far away as Iowa. Scientists used pushpins on topographic maps and spreadsheets to track these sightings. Advanced equipment like that deployed on the pelicans, in contrast, communicates with satellites which in turn send their data to a website. The webpage then automatically translates those locations to a dynamic, colorful map. The Pelitrack site offers unprecedented access to the lives of these majestic birds. The website and all its data is available not just to the people studying the birds but to anyone at any time. Users can see where birds currently reside or they can use a query tool to see where the pelicans have been in the past. They can look at locations from multiple years or the last week. The Pelitrack site has shown us fascinating things about these birds. Collectively, we see that most of the pelicans head south in fall, seeking the warmer climes of Mexico. A pelican christened Loretta is a classic example of this path: she follows I-15 southward, then flies to southern California before heading down the western Mexican coast. The bulk of the birds pass through Arizona and southern California like this but a few, like Gregory, ‘wobble’ in their southward journey, passing through New Mexico. These wobblers largely parallel their compatriots for they too end up on Mexico’s west coast. Individuals, however, reveal surprising variation in the Utah birds. Five backpacked pelicans (Bartholomew, Kirk, Hook, Lupita and Quentin) have proven outliers in terms of seasonal migration. In previous years, they left Utah on a strong eastward track, Bartholomew stopping in South Dakota before nearing the others’ paths through Kansas and Texas. Their tracks diverged again in Mexico: the other pelicans crossed the nation to winter on the west coast while Bartholomew spent his winter on the Gulf coast — the only backpacked bird to do so. 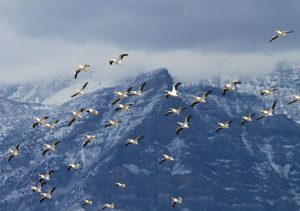 Chester was another iconoclast, holding the distinction of being the first bird to demonstrate that, despite previous thinking about state populations, the American white pelicans of Utah are part of a much more widespread, regional population. Summer locations from pelicans like Chester show a previously unknown degree of connectivity between the Great Salt Lake wetlands, the nesting colony at Gunnison Island, Utah Lake, Strawberry Reservoir, other bodies of water in Utah, the nesting colonies along the Snake River in Southern Idaho, as well as nesting colonies in Montana, Wyoming, Nevada, California and Oregon. Wing tag reports had exposed pelican movements between these locations in the past but they were assumed to be once-in-a-lifetime trips. The satellite data, however, revealed that it’s far more common for a pelican to travel among these sites than previously believed: some birds made multiple trips in a week! During Chester’s wanderings, his backpack dutifully recorded points as he literally broke barriers, flying back and forth over California’s Sierra Range – long thought to have been a formidable obstacle for pelicans. Following Chester’s pioneering performance, Uma and Everett were seen to likewise traverse the mountain range. Age and experience may contribute to some of the variation we see. Many pelicans follow each other with amazing fidelity but other birds like Gerald and Penelope made their own trails. It’s risky for a water-dependent bird to fly over unknown territory, but perhaps the cumulative experiences of these birds led them to safe routes. For instance, Barnabus followed his fellows through the Salton Sea in Southern California in 2015, but the next year he took a new path through New Mexico. The details of the Pelitrack maps show unequivocally that the paths of pelicans predict water. On their seasonal journeys north and south, and during other wanderings, pelicans fly from water body to water body where they rest and refuel by cooperatively foraging for fish. Zoom in on any Pelitrack path and you will find lakes, reservoirs and rivers. Certain places, like southeastern New Mexico and western Texas, are devoid of satellite points from Utah pelicans probably due to the fact that these areas have precious little water — evidently less than required to entice the water-loving birds to pass over. As time passes, more stories appear. Pedro decided to spend his days in Mexico westward of his fellow Utah birds; he was the only backpacked bird to settle on the peninsula of Baja California. In 2016 Hector visited locations apparently unknown to other backpacked birds – he was the only Pelitrack bird to fly to Oregon. Ongoing analyses have revealed that pelicans like Iris and Sylvester have ridden thermals to 27,000 and 33,000 feet, respectively. At such dizzying heights, the temperature hovers at -30 degrees and the air is lethally thin, placing American white pelicans into a small fraternity of fantastically hardy birds capable of surviving those conditions. Only the future knows what other secrets the transmitters will whisper to us in the form of satellite data. Sam Hall, a DWR Senior GIS Analyst, custom-built the Pelitrack website for Utah’s pelicans but it has proven so useful that the code is currently being used by five other research projects to study California condors (The Peregrine Fund), golden eagles (US Fish and Wildlife Service), long-billed curlews (Intermountain Bird Observatory), short-eared owls (Hawkwatch International) and burrowing owls (University of Idaho). The reception to Pelitrack has been positive and we believe that the satellite-to-website model will continue to bring enlightenment and entertainment to birders young and old. See the pelicans’ fall migration below. Early September I was up at the Spiral Jetty and happened upon a dead pelican. I took a photo of the tag number on the bird. Is there somewhere I can send that photograph?